Hi! To all of the 36th Avenue’s friends! gardening, and a little dose of everyday life! The 1st day of school is quickly approaching and sometimes it’s sad to let those little kiddos go! fun lunch can brighten their day!! Most of the ingredients for this lunch are probably already in your pantry! 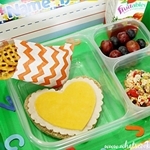 1 divided disposable container 1 slice whole grain bread 1 slice turkey 1 slice cheddar cheese 2 tsp mayonnaise 3 heart cookie cutters, varying sizes Using the largest cookie cutter, cut bread in shape of a heart, using medium sized- cut the cheese, using the small sized-cut the cheese. Spread 1 tsp mayonnaise on the center of the bread, layer the turkey on top- centering. Spread 1 tsp mayonnaise on the center of the turkey, layer the cheese on top- centering! 1/4 C red grapes 1/4 C blueberries 4 decorated toothpicks, with the point snipped off Make sure to cut the tip of each toothpick off, then there’s no chance for a poke! Thread grapes and blueberries on to toothpicks, alternating. 1 strawberry fruit roll up, cut into 1/4 inch strips 1 Tbsp butter 1 16oz package of mini marshmallows 3 mini chocolate chips per critter 4 C Rice Krispies 4 C Fruity Pebbles Cooking Spray In a microwave safe bowl add butter and marshmallows, microwave 1 minute, stir, microwave 1 more minute, stir. Stir in 4 C Rice Krispies and then 4 C Fruity Pebbles, stir to coat. To make Critters: spray hands with cooking spray, roll 3inch ball and a 1inch ball for each Critter you’d like to make. Connect 1 large and 1 small Krispie balls to make each body and head. You have to work quickly while the mixture is warm so it will cool and stick together forming the body. Decorate with mini chocolate chips and strips cut from fruit roll up. Of course, you can substitute whatever you happen to have in your pantry! 1st Day of School Lunch is a nutritious way to brighten up your childs day! It maybe fun to put a little note of encouragement in there too!! My kids have always like getting a quick note from me in their lunch boxes… it lets them know they’re always on my mind and that I love them. AND I just want to say a BIG thank you to “the 36th avenue” for having me! I met Desirée at the Evo blogging conference a couple of weeks ago… she is just the cutest little thing and I’m SO glad I got to know her! She’s just amazing as most of you already know!! I am so excited to have Ruthie with us today. She is an incredible woman and it was so much fun to meet her during EVO. Ruthie will be sharing her talent with us every month as a contributor. Here are some other recipes that you can find over at her blog. What about some delicious Grilled Banana Splits? …or this Slow Cooker White Chicken Chili.